The solitary housing unit (SHU) was created to discipline the most violent offenders in prison and separate them from the community, but who is really sitting in the SHU? According to a new study by the Vera Institute of Justice, most individuals in solitary confinement are there for low-level, nonviolent offenses such as disobeying a correction officer. 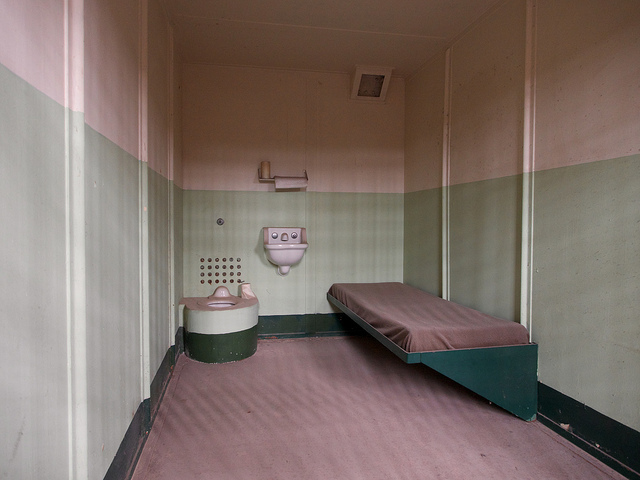 The study, which collected data from restricted housing units in Nebraska, Oregon, North Carolina, New York City, and Middlesex County, NJ found that low level offenders could be in solitary confinement for a few days or a few months. In Nebraska, “disobeying an order” accounted for 28 percent of such sentences. In North Carolina, none of the top 10 infractions resulting in disciplinary segregation were among the most serious charges, as determined by the Department of Public Safety. And in Oregon, 58 percent of disciplinary segregation sentences were for nonviolent infractions. Consequently, since Vera conducted these analyses, the North Carolina Department of Public Safety has significantly altered its policies governing disciplinary practices, and the Nebraska Department of Correctional Services has ended its use of disciplinary segregation altogether, the study said. Currently, there are around 80,000 to 100,000 prisoners in segregated housing units around the nation that use isolation and deprivation to discipline inmates. Such punishment has been widely criticized by advocates as inhumane and abusive. Moreover, the study found that infrequent reviews and the lack of set release dates and clear pathways out of administrative segregation led to long stays in the SHU. For example, in North Carolina, more than 1,200 people were being held indefinitely in segregation, waiting for their cases to be reviewed by a staff member or committee and they were judged ready to return to the general population. However, these reviews were infrequently conducted, the study found. In Oregon, people who were incarcerated typically spent between 60 and 150 days (approximately two to five months) in the Intensive Management Unit—a form of administrative segregation—before their first review. Long stays in isolation can have devastating affects on incarcerated individual’s mental health, making it even more difficult to return to their community upon release, noted the study. Men of color and those with mental health problems were the most likely populations to be sitting in solitary confinement. In Nebraska prisons, a combined group of Asian Americans, Pacific Islanders, Latinos, and Native Americans had the highest rates of contact with restrictive housing, with 17 percent in the most-restrictive settings as compared to 9 percent of white people. In Oregon, people of color made up 26 percent of the total incarcerated population but 34 percent of those in restrictive housing. Women and older individuals were less likely to spend time in the SHU, the study also found. While making changes in correctional facilities can be a slow, challenging process, the study noted, there are still revisions that need to be made, the Vera Institute concluded. Reduce the flow of people into various types of restrictive housing. Exclude certain vulnerable groups from restrictive housing. Shorten the length of time people spend in restrictive housing. Improve conditions in restrictive housing. Assist people in transitioning to a facility’s general population—and whenever possible, avoid releasing them from restrictive housing to the community. This summary was prepared by Megan Hadley, a reporter at The Crime Report.